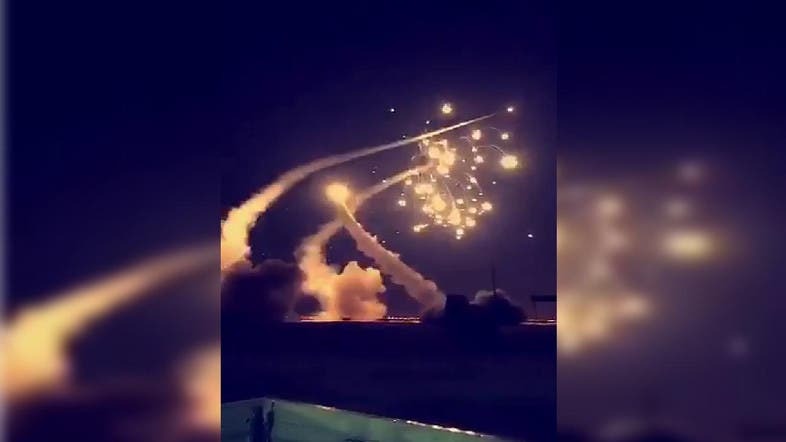 A video sent to Al Arabiya shows what appears to be the moment anti-defense missiles were fired from Saudi Patriot batteries to intercept the Houthi missile over the capital. Saudi forces intercepted seven Yemeni rebel missiles on Sunday, including over the capital Riyadh. "This aggressive and hostile action by the Iran-backed Houthi group proves that the Iranian regime continues to support the armed group with military capabilities," Arab Coalition spokesman Turki al-Malki said. Witnesses confirmed to Al Arabiya loud explosions and bright flashes in the sky. Since November, Yemen’s Iran-aligned Houthi militias have fired multiple missiles into Saudi Arabia, all of which Saudi forces have intercepted.